The green and white metal building on Strathmore Avenue, surrounded by drought-resistant plants, stands out from other North Village apartments in the area. 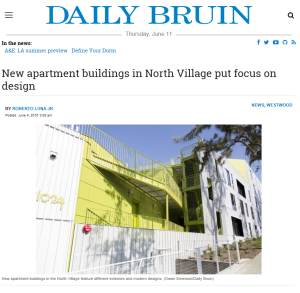 Architects for these new apartments said they aimed to add to the variety of buildings in the North Village by using glass to make rooms look bigger and to make them more modern. Students can now lease apartments at Studio 11024, Ophir Terrace and the new university apartment building on Glenrock Avenue. Some students said they think the new buildings will be more comfortable than older ones, while others questioned their affordability and new design. Bill Wilhelm, president of R.D. Olson Construction, said the goal was to construct trendy and eco-friendly apartments in the new building, Studio 11024, which is located at 11024 Strathmore Drive. Wilhelm said the company redesigned the building’s exterior as new materials were introduced. He said he thinks changing from plaster and bricks to metal and wood improves the structure’s ambience. Studio 11024 is intended to be high-end, but the building was still designed with students in mind, Wilhelm added. Read more here.